So today article is gonna be….well different. As all of you who read (Social) Contract from Below know. Most of my articles are one cohesive thought or idea (such as “I hate slow play” or “play more answers”) that I then punctuate with other elaboration (and things I think sound witty in parenthesis). This week I’m doing the opposite. I’ve had a bunch of small bits (we’ll call them nuggets) of thought floating in my mind for a while. While none of these would make a good article (many of them could not even make a full paragraph) I thought I’d share them with you and see if they can provide some conversation in the comments. We also have the final step of building Ruric Thar today so I’ll introduce that near the end. So without further ado, here are 24 Commander-y things that Nole has been thinking. With I’m guessing 30 new slivers being added to the pool, everyone is going to want to build a five color sliver Commander deck. How many weeks will I have to run Plague Sliver, Extinction, and Tsabo’s Decree before the sliver players realize that 60 slivers + 40 land does not make a very resilient deck? Why are orange dragon shields twice as hard to come by as any other color? Is Keldon Firebombers socially acceptable to run? On one hand it stops ramp decks cold on the other it sure angers a lot of people when you drop it late game and reset everyone back to three lands. 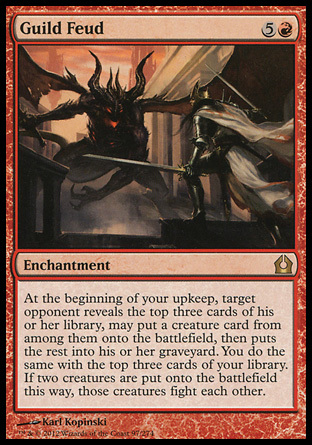 Why is Kozilek, Butcher of Truth $35? The best part of Modern Masters has been that I now have a stack of Eternal Witness. I’m not one for staples being auto includes but that card it so sweet. I wonder if the Cult of Rakdos or the Gruul Clans would throw a better backyard barbeque. I’ve recently fell in love with Sudden Impact. I wonder what the highest number that has been dealt with that card in commander. There has got to be a way to play Deadeye Navigator and not feel like a scumbag, but I have yet to find it. Is it sad that “try to make Living Death uncastable” seems to be on my to-do list with every deck I build? Could #8 and #9 be related? I wish there was a “This card has a bad pun” filter on Gatherer. I also feel that the “bad pun” indicator icon should be a tiny picture of LSV’s head. I feel that it’s a flavor violation that my #huntmasterofwinterfell deck cannot run Huntmaster. Does anybody think that, while the black on black planeswalkers look sweet, they are going to cause a ton of headaches in actual gameplay or is that the judge in me talking? I actually think that hard lock decks are the single meanest thing you can do in Commander. While things like Mind Over Matter/Temple Bell or the like are objectively more powerful, they at least kill the table fairly quickly. With hard lockouts, you die by inches. THIS STATEMENT HAS BEEN REDACTED AS IT COULD BE AN ENTIRE ARTICLE. I am incredibly OK with the power level of planeswalkers coming down some (as it seems in M14 and Rav block they have). If I were to announce what big events I was going to (such as GP’s or Star City Opens) would people actually like to meet me or would it just be me tooting my own horn? I wish someone would send me a Thelonite Monk on Pucatrade. Is there enough cards out there for a “Price is right” themed deck? The easiest way I’ve found to find out what your deck is lacking is to let someone else playit while you watch. You’ll spend all game wondering why they don’t play more X and then realize that you only have 3 things that do X in there. Who would you rather have coach your kid’s little league team, Ajani or Garruk? I often wonder how much my local meta sculpts my articles. There are a lot of things that I talk about that are pet peeves in my play groups that other people seem more ok with and vice versa. Why is it that I can play commander for 8+ hours no sweat but if asked to play in an all-day standard tournament I immediately try to get on the judge staff so I don’t have to play? Yep, seriously. This card exists. This card is terrible for 60 cards formats. However, with as many big dudes that we will have in our deck it turns into a free dude every upkeep. That’s it for this week. I’d love to hear what your thought are about my 24 thoughts as well as a sweet 99th card for Ruric. I’ll be in with something a little more typical next week.